The San Fernando Valley’s leading business newspaper featured Collaborative Divorce and Family Divorce Solutions in its recent “Family Law” special section. 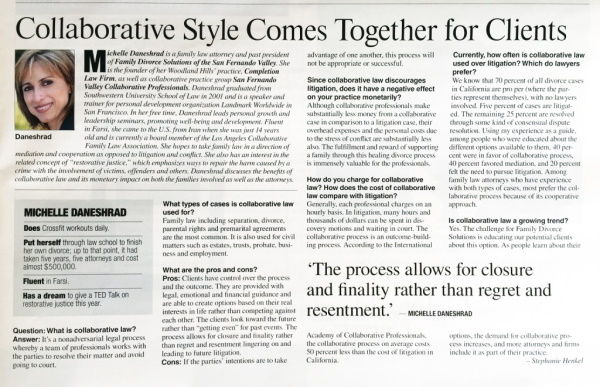 The San Fernando Valley Business Journal interviewed member Michelle Daneshrad, a family law attorney and Collaborative Divorce practitioner, in a question and answer format article titled “Collaborative Style Comes Together For Clients.” Daneshrad described Collaborative Practice, explained the types of cases suited to Collaborative Law, how often it is used, and the pros and cons for clients. The article can be seen below (please click to open and read), or viewed on the website (subscription required). Michelle Daneshrad was interviewed for this Q&A article in the March 6 edition of the San Fernando Valley Business Journal.